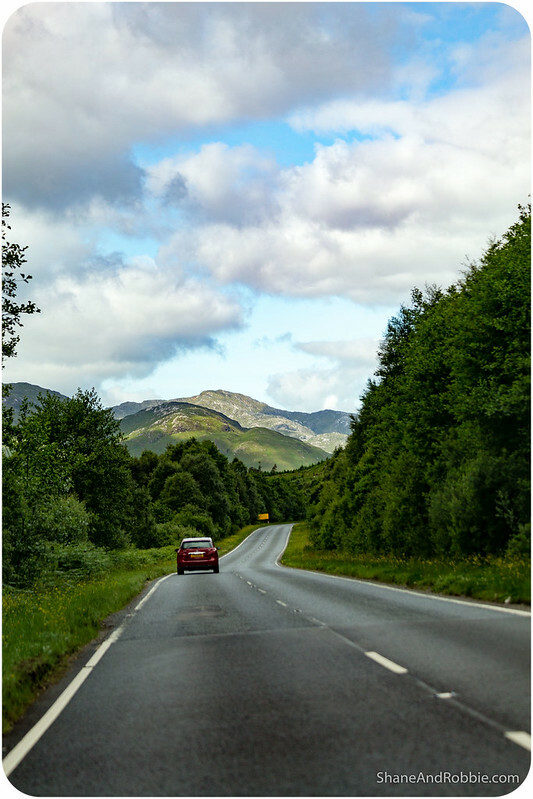 There’s so much to see and do around Fort William that we just couldn’t decide on ONE thing to explore for today. Instead we got ourselves a rental car and saw it all! 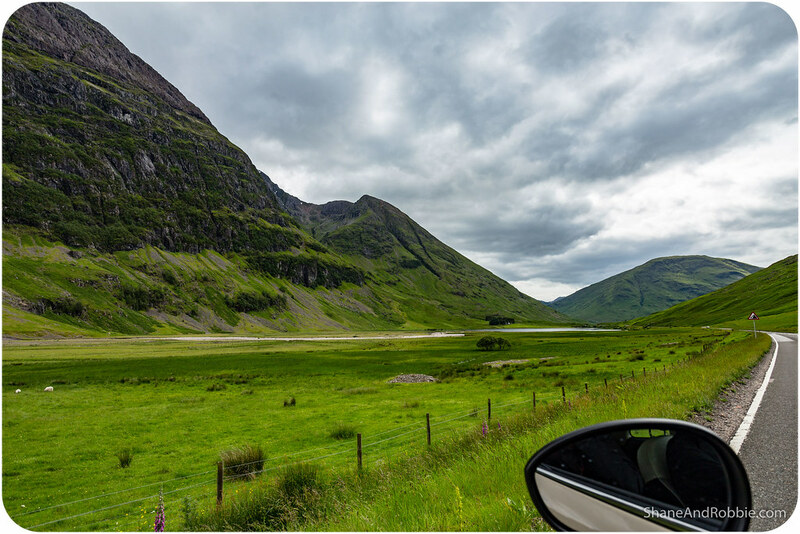 We took ourselves on a tour of the western highlands, from Glencoe to Mallaig, stopping along the way to see the highlights, take a few photos, and enjoy the diversity of Scotland’s landscapes. 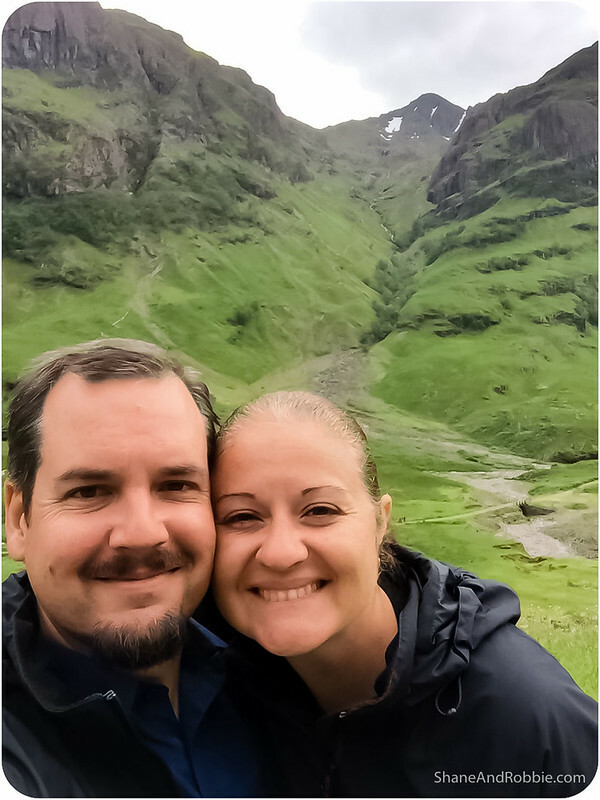 We drove through rolling glacial valleys, past majestic mountains, and along the rugged Atlantic coastline. It was a day of splendour and wonder that we’ll not soon forget. 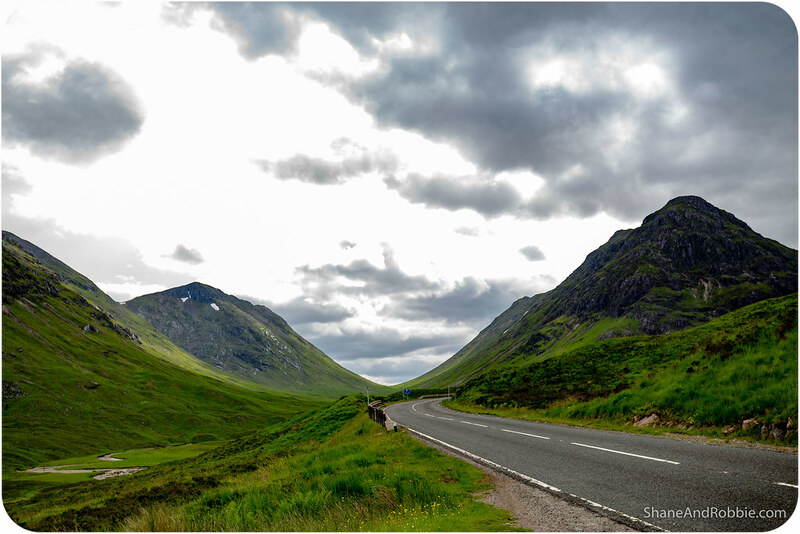 The A82 winds its way through the valley (“glen” in Scottish parlance), past some of the tallest mountains in Britain. In winter the area is snow covered and bitterly cold, but at this time of year it’s green and lush. 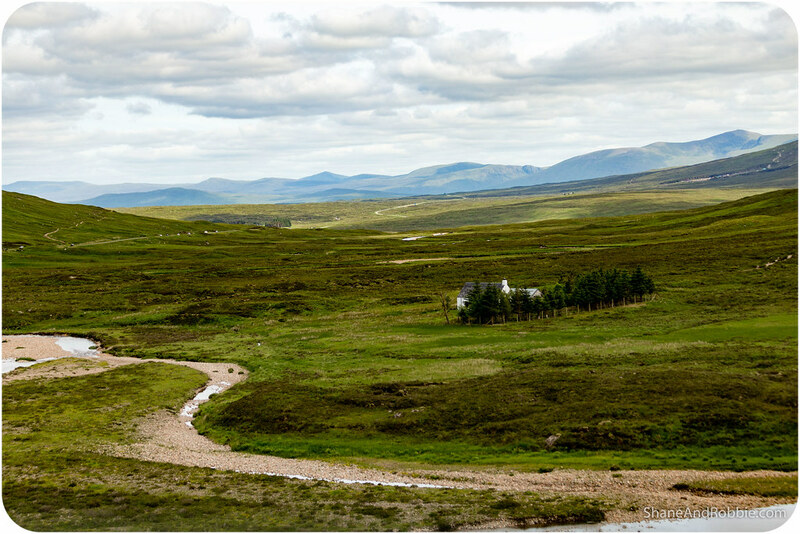 We passed a few isolated homesteads along the way, but mostly the valley is inhabited only by wildlife. 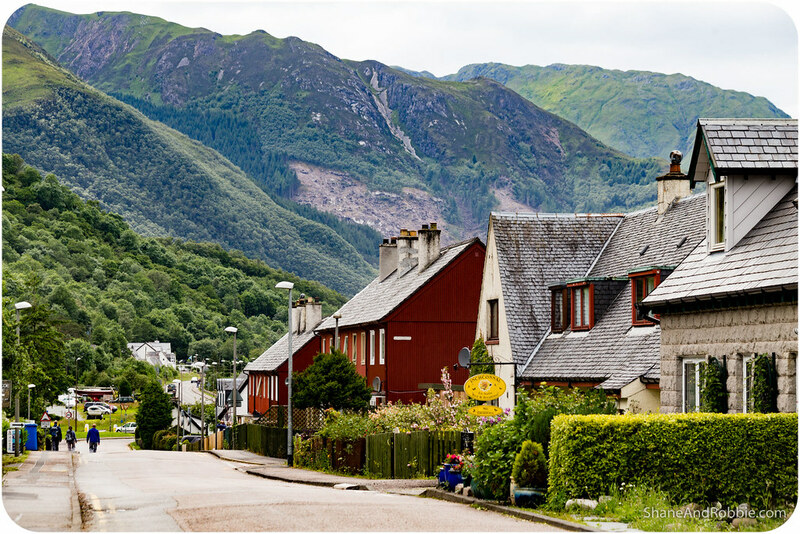 The only town in the glen is Glencoe village. Imaginatively named after the valley it sits in, this small township is surrounded by wild and precipitous mountains and sits on the banks of the River Coe. 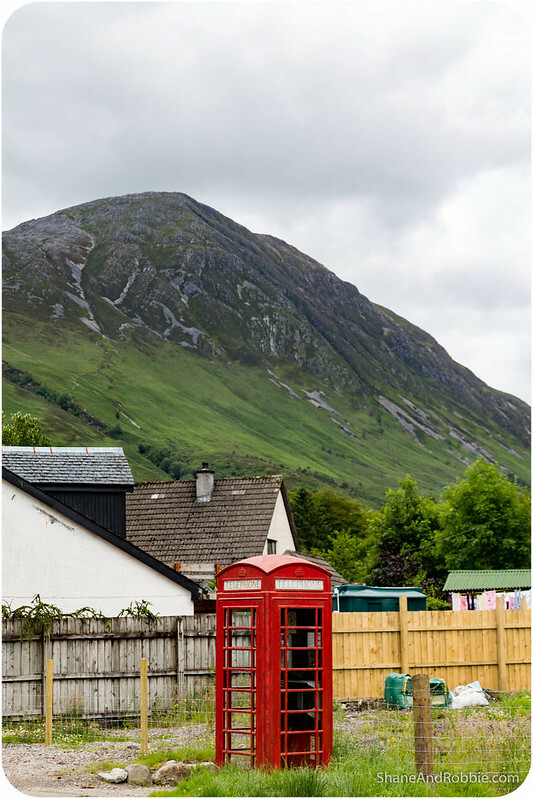 The village’s spectacular setting has made it popular with film-makers; in recent years Glencoe has been the setting for one of the Harry Potter films and the 2012 James Bond movie “Skyfall”. 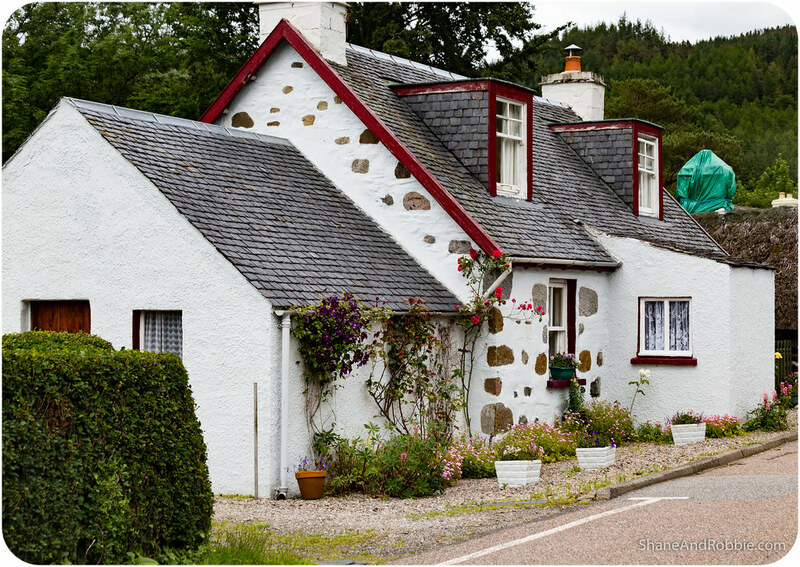 We stopped in the village for a coffee and took a stroll through town and along the River Coe. 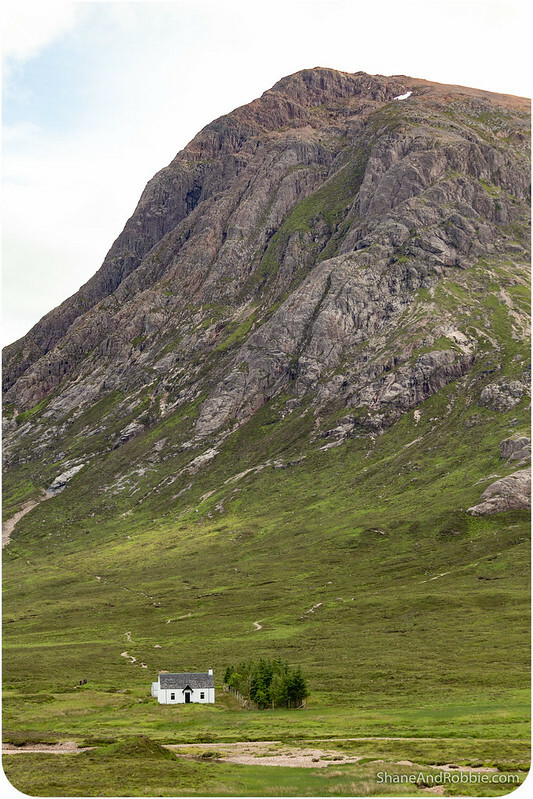 Along the way we read a bit about the village’s most infamous moment in history: the Massacre of Glencoe. 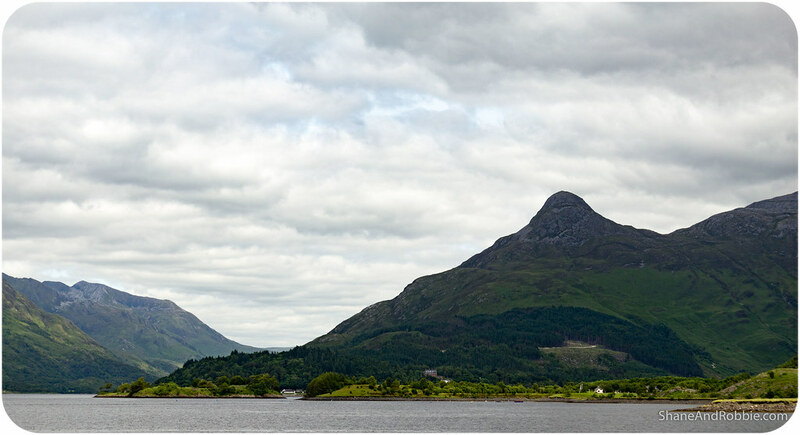 It was early in the morning of 13th February 1692 when members of Clan MacDonald of Glencoe were killed on orders of King William III. 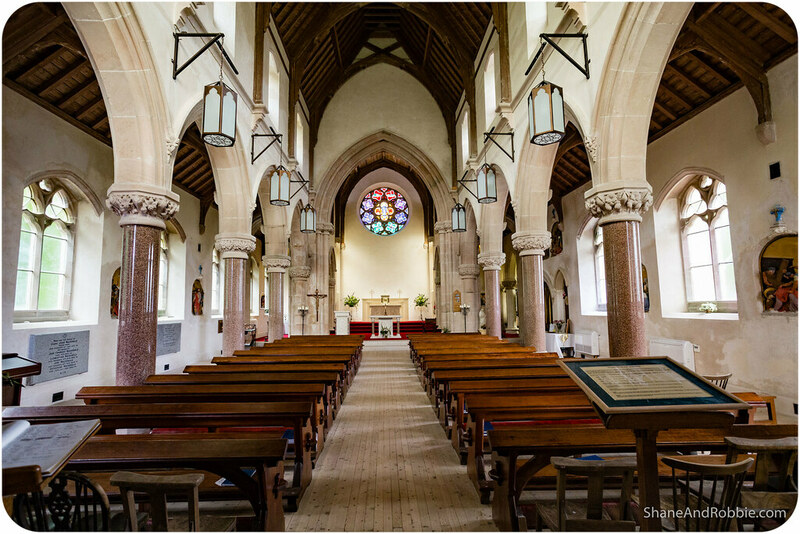 This was just one of many such events that occurred up here in the Scottish Highlands during those years of rebellion against the Protestant forces of William of Orange. Not that its macabre history made the village of Glencoe any less appealing today – it was a great coffee stop and far more character-filled than Fort William. 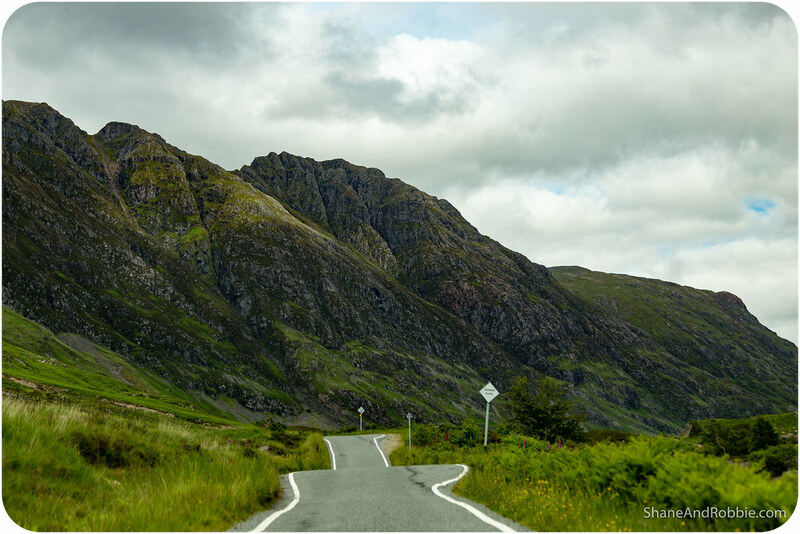 From Glencoe we headed off along another of the Western Highlands’ spectacularly scenic road, the A830. 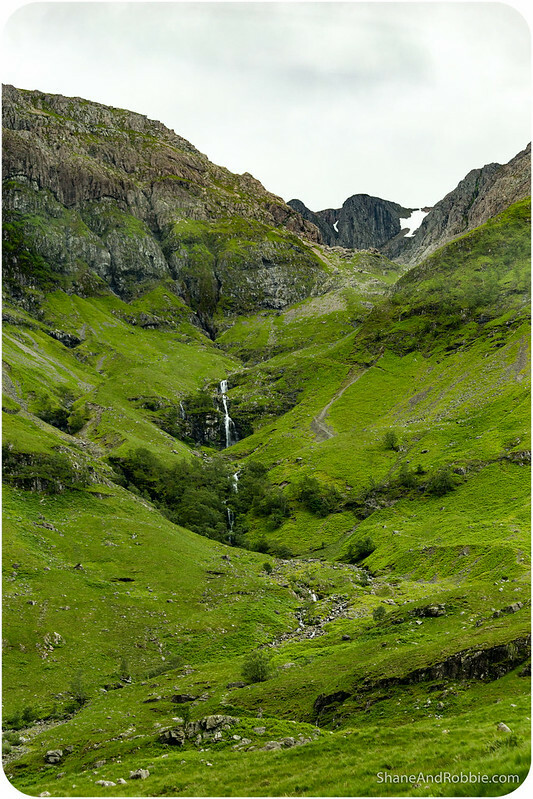 Known as the “Road to the Isles” the A830 connects Fort William to the port town of Mallaig, following an ancient drover’s road that was once used to move cattle between their summer and winter pastures. 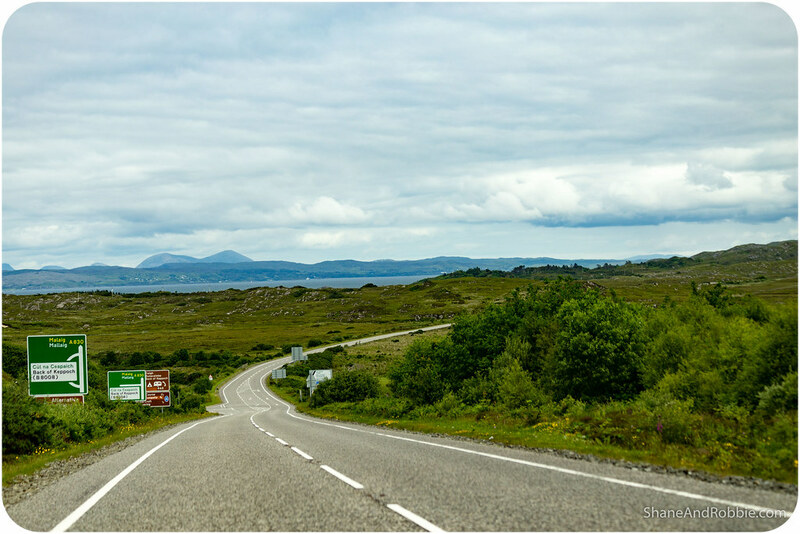 Steeped in history, the Road to the Isles took us through striking hill scenery and past a number of lochs to the ruggedly beautiful Atlantic coast. 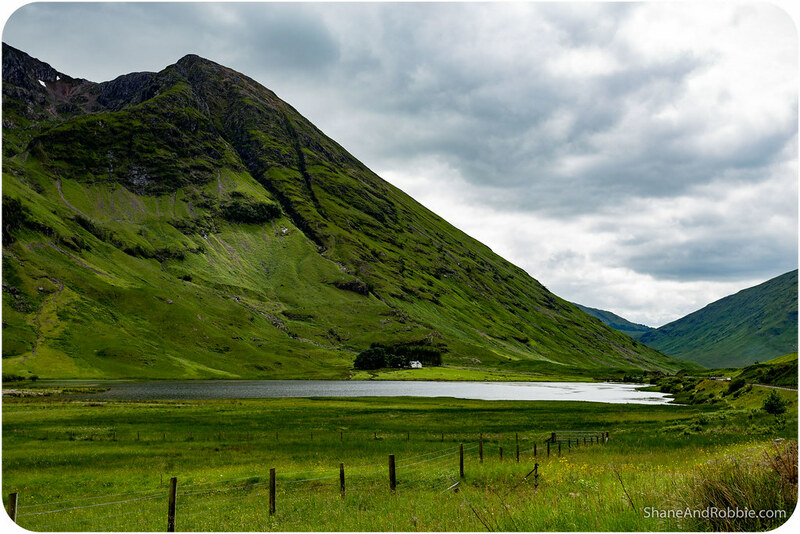 One of these lakes, Loch Eilt, has been used as a location in several films – most recently the Harry Potter films. 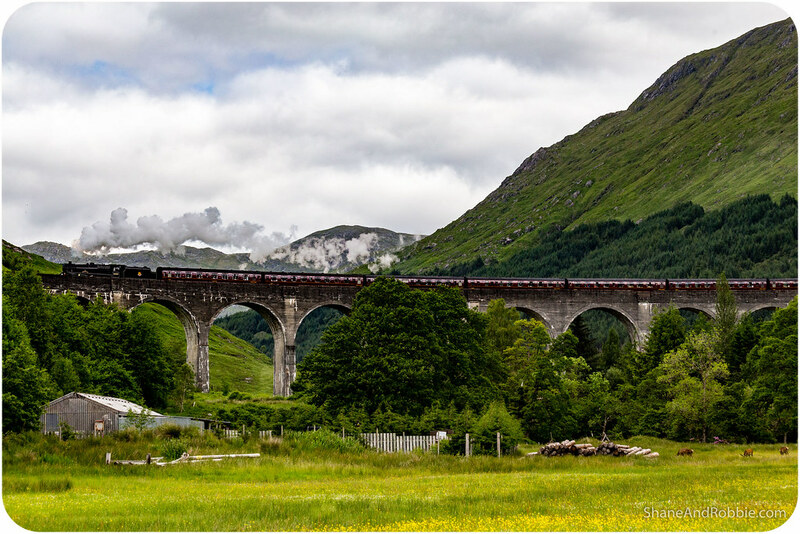 Another place we stopped at along the Road to the Isles that’s been made famous by the Harry Potter film franchise is the viaduct at Glenfinnan. Built in 1897 the structure is still in use by trains today. 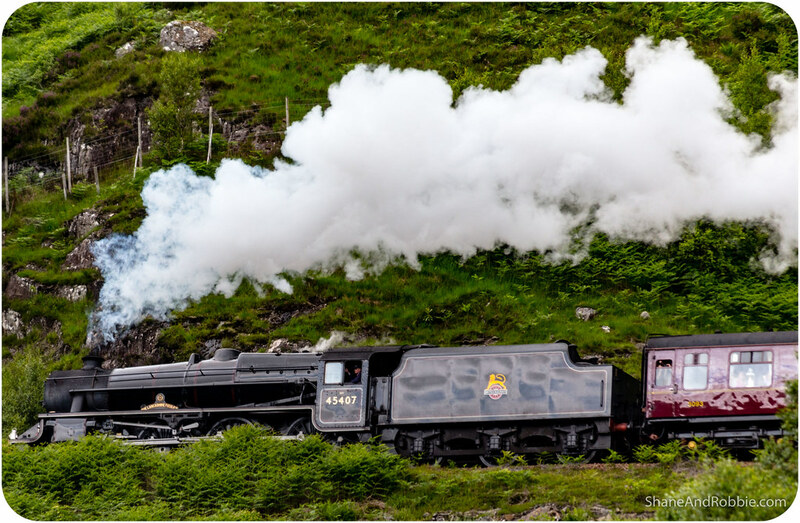 Most famously the Jacobite Steam Train (a scenic train that runs from Fort William to Mallaig) crosses the viaduct every day at around 10:45am on its morning run. 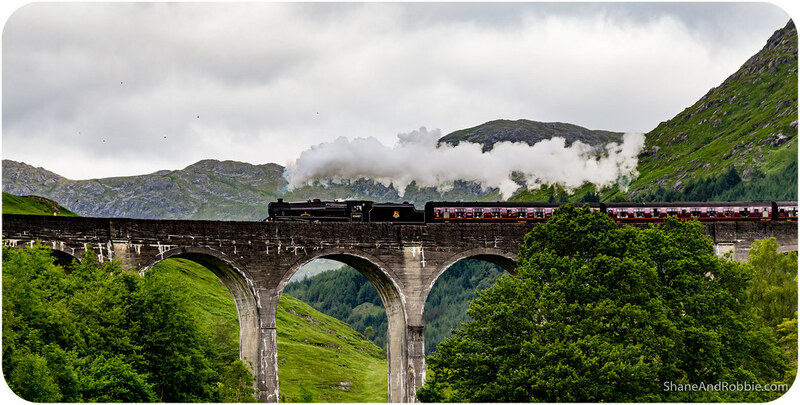 We stopped to admire the viaduct and were lucky enough to be there as the train puffed its way past. 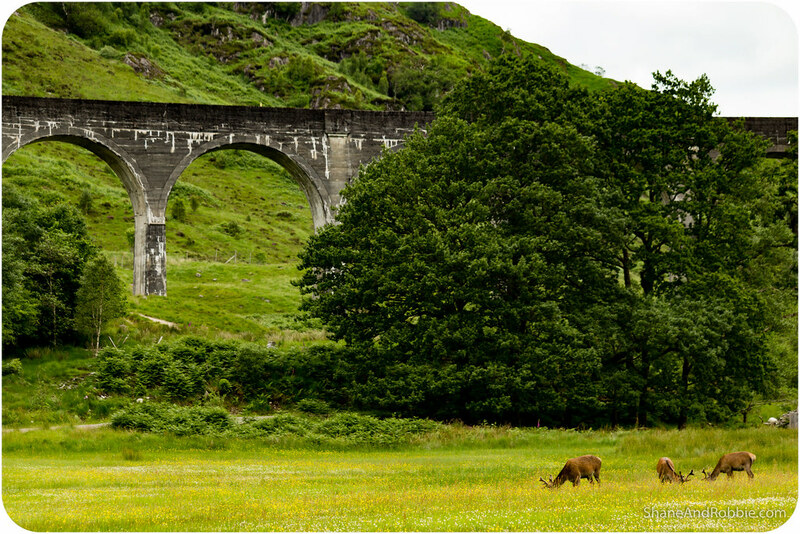 Even better we had a small herd of adolescent male deer in the field under the Glenfinnan viaduct to admire as well! 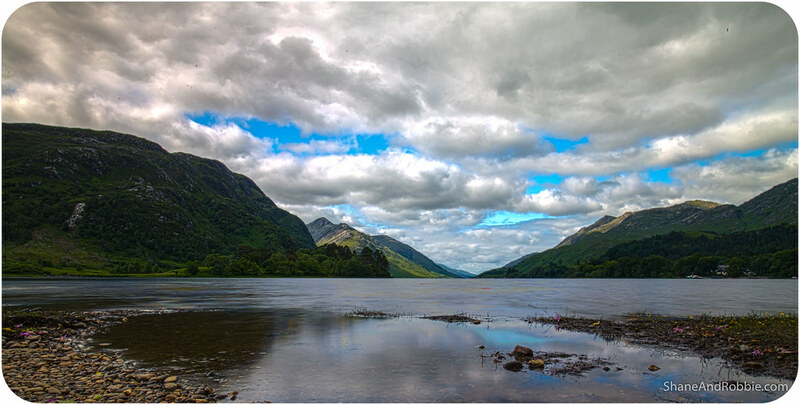 The area around Glenfinnan is where Bonnie Prince Charlie famously raised his standard in 1745, which involved raising the flag of his family, the Stuarts, and a call to arms for local clan chiefs to support the 2nd Jacobite Rebellion* against the British throne. 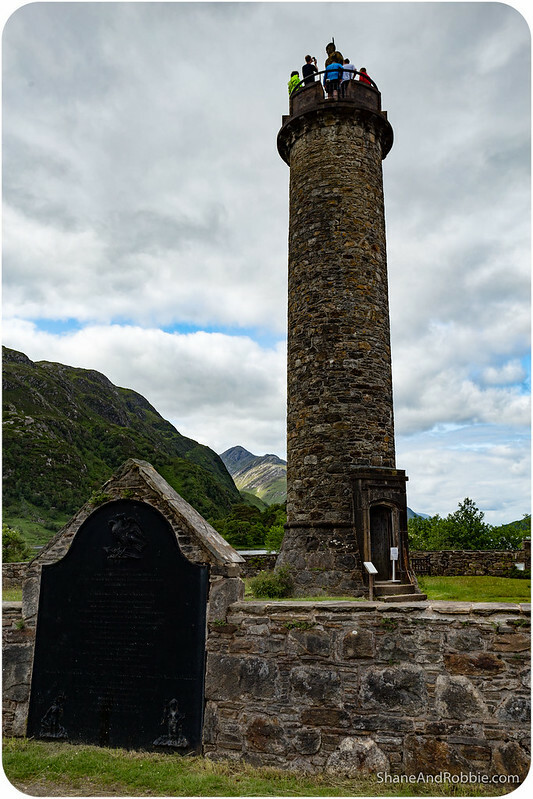 Near the viaduct, at the head of Loch Shiel, a monument has been built to commemorate the place where it all began. *The Jacobite risings were a series of uprisings in Great Britain aimed at deposing William of Orange and returning James II to the throne of Great Britain. The series of conflicts takes its name from the name Jacobus, the Latin form of James. 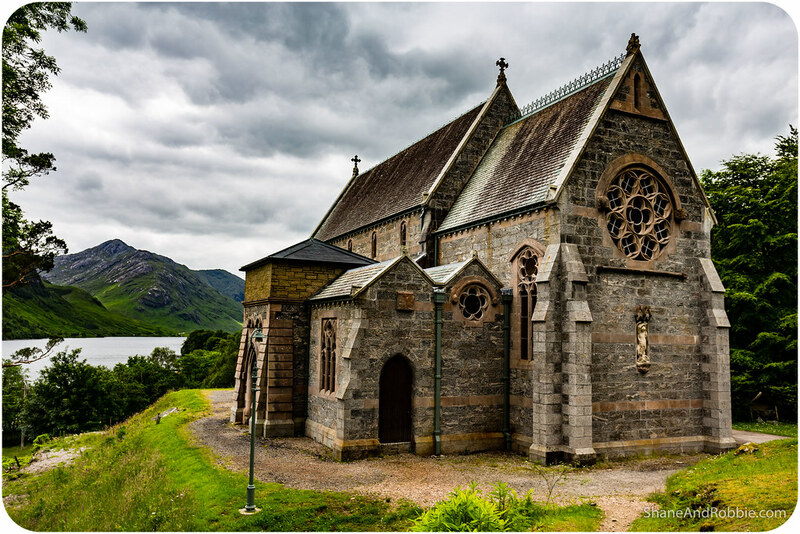 We also stopped in to admire the 19th century Glenfinnan church, mostly because of its spectacular setting above Lock Shiel. 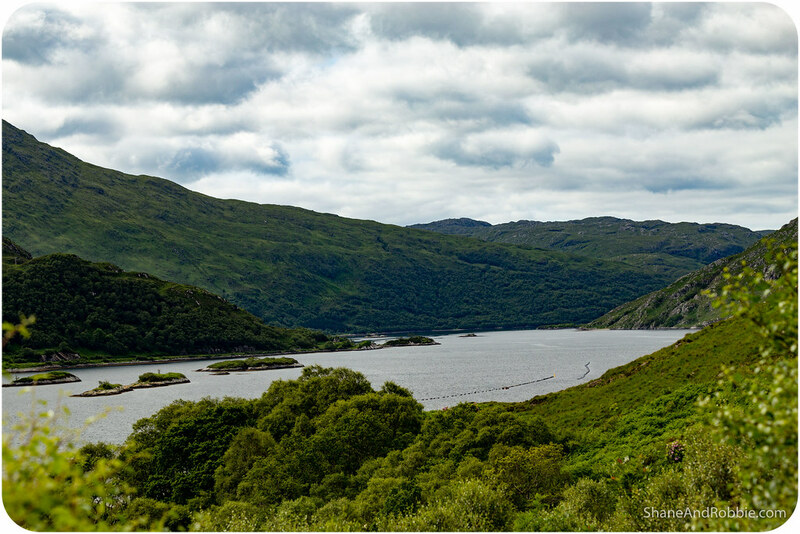 Glenfinnan really was one of the highlights of the day and we thought the day couldn’t get much better, but then we got to the Atlantic coastline and a different kind of beauty revealed itself. 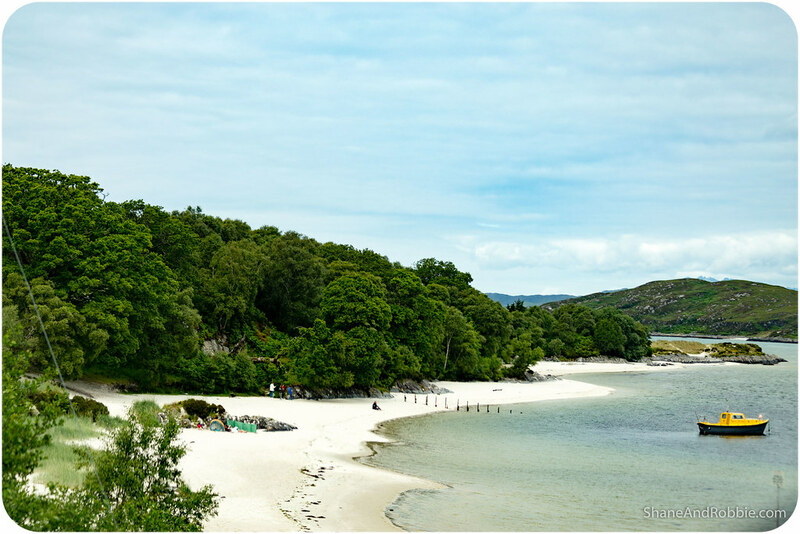 The sheltered bays and pristine white beaches around the hamlets of Arisaig and Morar were worth a detour, though the water was WAAAAY too cold to even contemplate swimming! 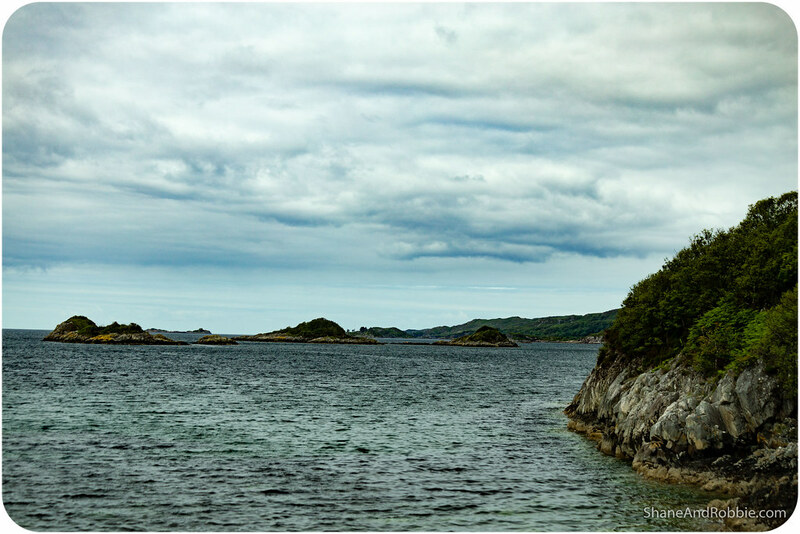 Close by is Loch Morar where some of the movie “Rob Roy” was filmed; 19 km long and 300m deep in places, it is the deepest fresh water loch in Europe. 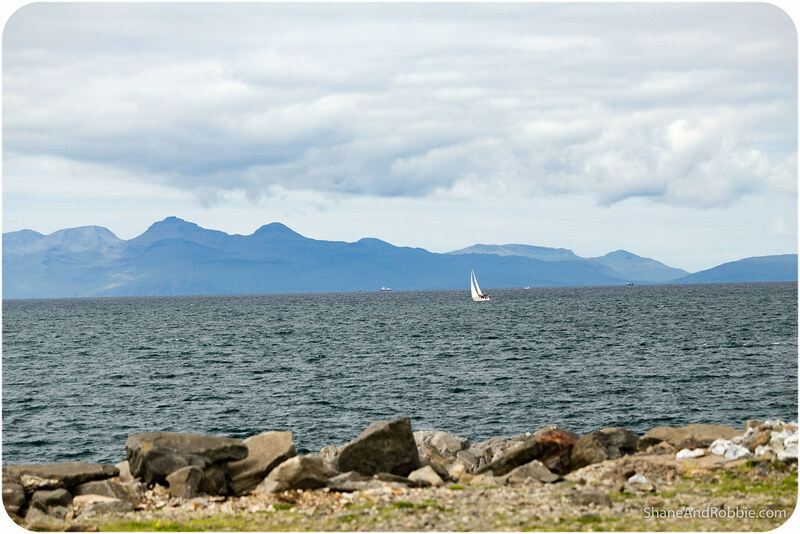 We read on a plaque by the waterfront that the loch is said to be the home of a monster called Morag. Sightings date back to at least 1887, but the most famous incident took place in 1969 when the creature bumped into a boat. 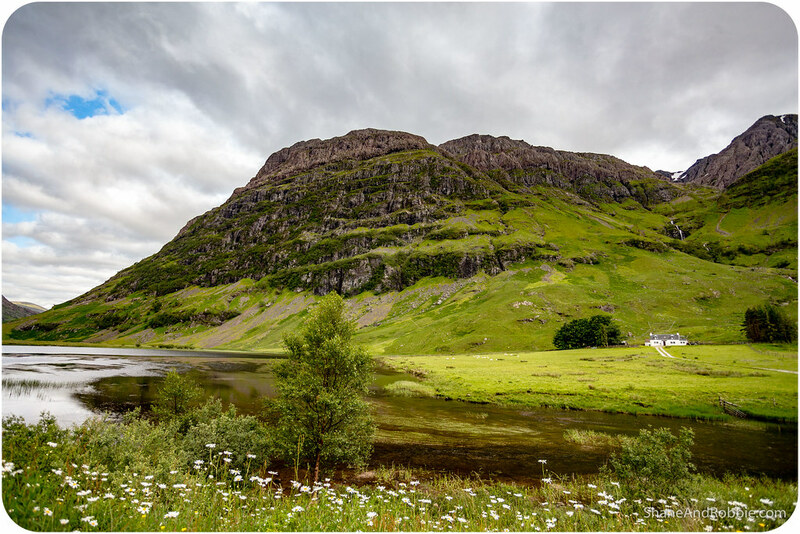 Apparently the loch was surveyed by a team from London University several times during the 1970s and 3 sightings were made, but no photographs taken. We kept our eye out but no loch monsters were on show today. 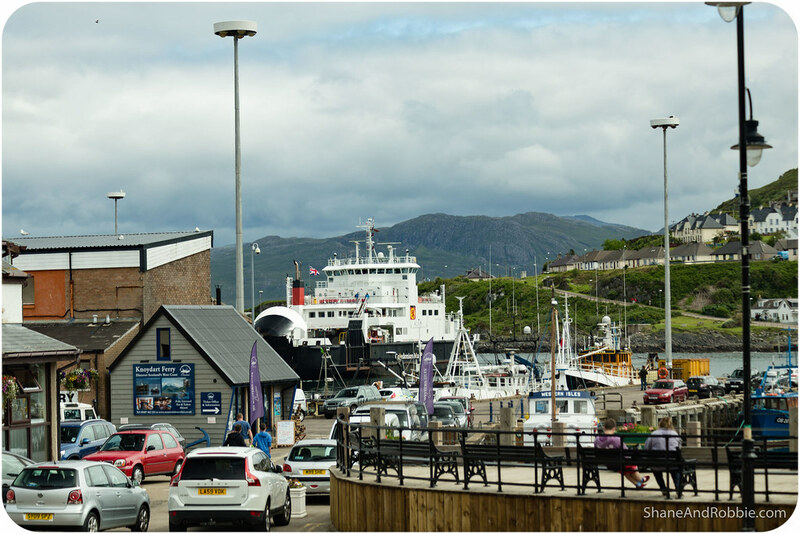 Our final stop on the Road to the Isles was the town of Mallaig. 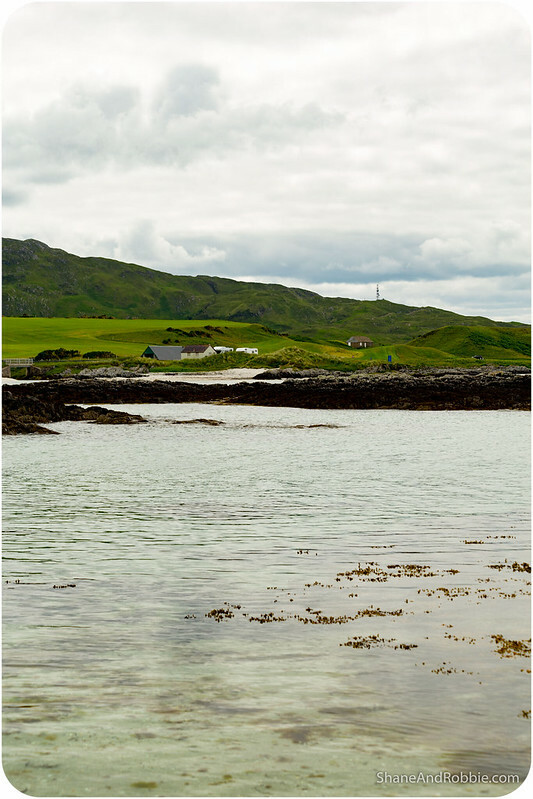 This small fishing port overlooks the Sound of Sleat, which separates the Scottish mainland from the Isle of Skye, and is the main commercial fishing port on the West Coast of Scotland. During the 1960s it was the busiest herring port in Europe; today the fishing is primarily focussed on crustaceans, especially prawns. 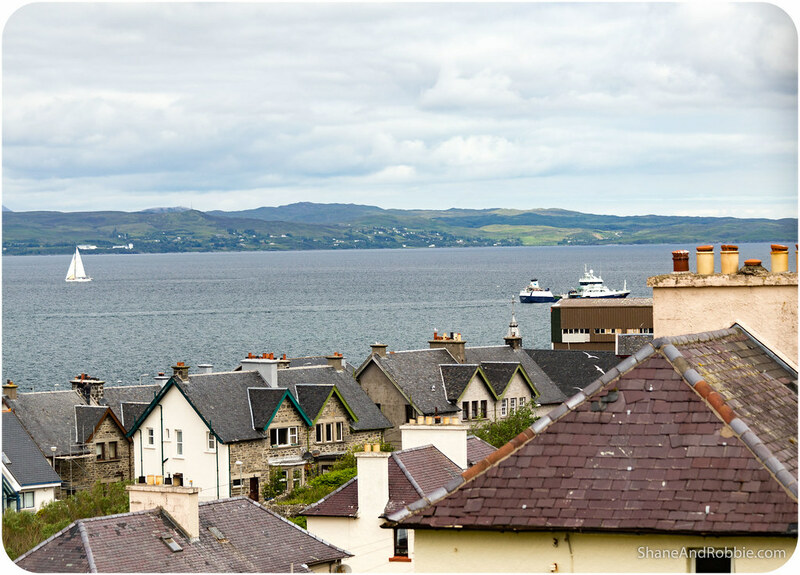 Mallaig was the end of the line for us today. We stopped there briefly for another snack before heading back to Fort William for the night. 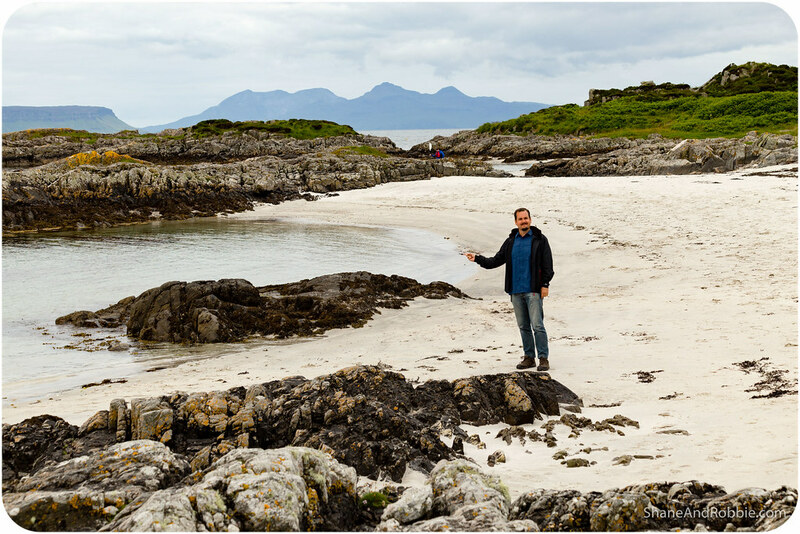 This western part of the Scottish Highlands is exceptionally beautiful and today we really just skimmed the surface of what there is to see here. 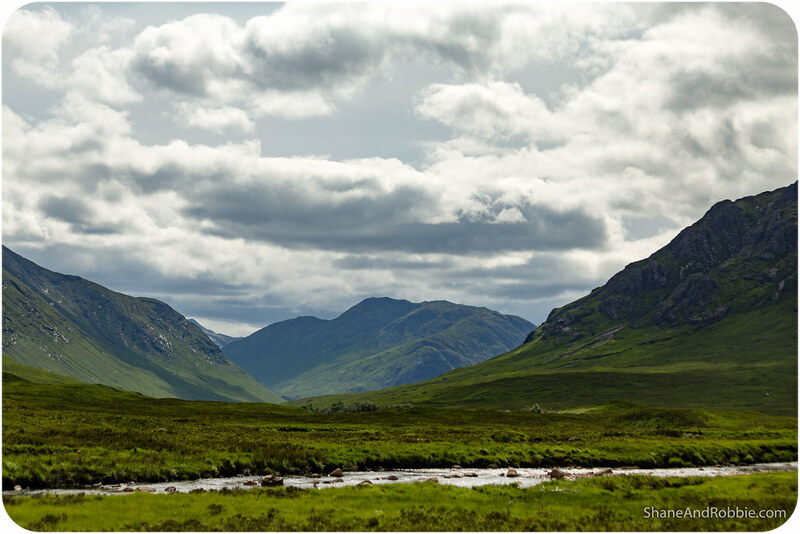 We could easily spend a month here, hiking through the hills and glens and admiring the scenery. 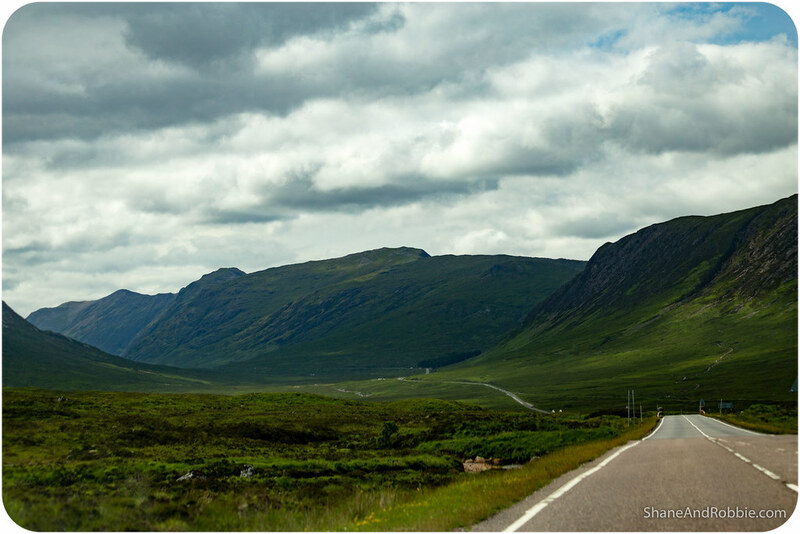 For now though we’ve decided to keep moving and continue our “samplers tour” of Scotland. Tomorrow we head north-east, to Inverness and beyond!